Thrift and innovation help keep dairy farms and a cheese plant competitive. “Welcome to biology. Welcome to cheese,” says Jan Teply, head of marketing, sales, and purchasing for Madeta, the Czech Republic’s biggest cheese maker. The room smells of butter and cream with an overlay of ammonia, one of the by-products of the mold cultures that are steadily streaking the 5-pound wheels with blue. Madeta started as an Austro-Hungarian dairy cooperative, collectivized during the Communist era, and evolved in the ‘90s into a family-owned company with four plants. 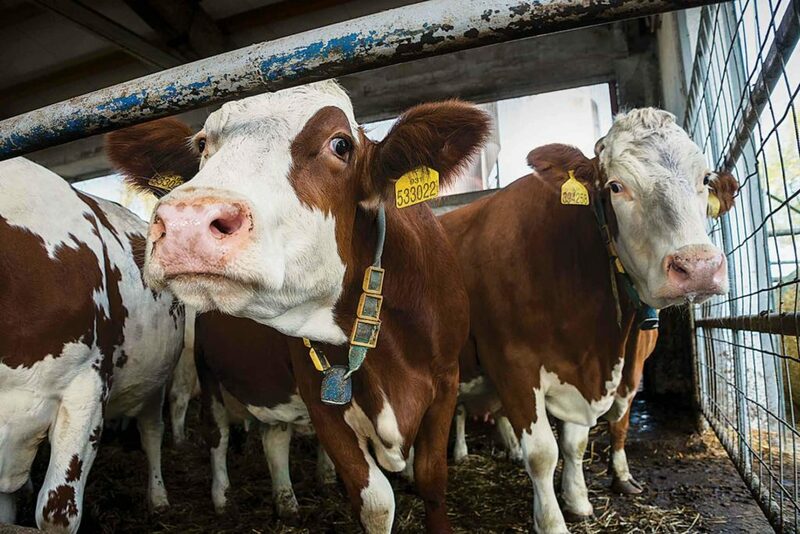 The Czech heartland of South Bohemia is at the center of Europe—ideal for exports—and enjoys a domestic reputation for high-quality dairy products. But competition for local milk with higher-paying German processors, an influx of cheaper cheese from western Europe, and the sudden loss in 2014 of its biggest export customer when Russia embargoed European Union (EU) food products have been a struggle. With his wide smile and irreverent humor, Teply is leading a charge to develop new products, rebuild export share, and stir enthusiasm in his home market with a buy-local campaign. Jan Teply, head of marketing for Madeta. Thrift. Madeta’s blue cheese effort is built on a tradition of Czech thrift. “We are a poor country. We say we don’t like waste,” Teply laughs. He says that’s why Madeta washes its blue cheese wheels before packaging. “Here we eat the whole cheese, not like in France and Germany, where they cut off the rind,” he notes. Scraps can therefore be made into processed products, including a powder that a commercial bakery incorporates into its rich blue cheese bread. Cheese bread is just one of the ways Czechs are embracing dairy products. Milan Novosad, Madeta’s chief milk buyer, points out that butter has enjoyed a renaissance across Europe, with average per capita butter use in the Czech Republic jumping from 8.8 pounds to 11 pounds since 2015. And food lovers have embraced cheese. Teply points out that Czech shoppers are often drawn to cheaper German, Dutch, or French cheeses, while it can be hard for him to sell premium cheese into other EU countries. Part of the problem, Teply believes, is that Madeta doesn’t use preservatives. His solution is marketing hard to Czech shoppers as a trusted, local supplier, and producing products like soft, white cheese popular in the Mideast. Fleckvieh cows at ZD Bernartice dairy cooperative. Buy local. Local milk is a big plus. Most South Bohemian farmers milk Fleckvieh or Czech Red cows, closely related Central European breeds that deliver fat content of 4.0 to 4.7% and protein from 3.5 to 3.9%. Madeta inspectors visit each supplier twice a year to check conditions and quality. The blue cheese plant in Ceske Krumlov is supplied by 50 farmers. Some are small operations with 8 to 15 cows, while the larger suppliers milk 400 to 900 head, Novosad says. One of those large suppliers is ZD (which translates to “agricultural co-op”) Bernartice. In 2007, the co-op milked 278 head. With the completion of a new barn last winter, the herd is expanding to 800 milking cows, says Pavel Novotny, the general manager. Electronic neck tags feed production data into the farm’s computers, flag sick animals, and contribute to a national dairy cow database. Per-cow production averages 7,500 liters (17,040 pounds), which is high for Fleckvieh, Novotny says, and makes today’s co-op staff three to four times more productive than its Communist-era workers. Madeta’s demand and a dedicated work force, drawn by high-tech agriculture, portend a bright future, he adds. To Teply, it all comes down to local: local cheese and local opportunities. The last stop before export.